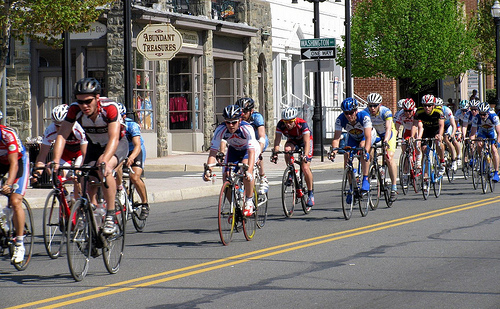 The Tour de Ephrata is a one-day bike racing celebration taking place May 1, 2011. World-class races will be taking place from noon – 6pm, but the fun doesn’t stop there. This year’s event organizers have lined up events for casual cyclists and kiddos too, so there’s truly something for everyone! At 2:00 pm there will be a “Celebrity Race” where you can compete against Senator Mike Brubaker, Ephrata Mayor Ralph Mowen, Akron Mayor John McBeth and others for this year’s bragging rights!! The kids races will begin at 3:00 pm. And for everyone who’s more interested in watching the action than joining it, there will be food vendors galore for your culinary pleasure from noon – 5:00 pm!! The event organizer is Road Cycling League. For participants coming in from out of town, the Historic Smithton Inn is the perfect Lancaster County Bed and Breakfast where you can prepare for the race, and afterward, rest those weary bones! We’re located just one mile from downtown Ephrata, we have seven spacious guest rooms, 3 with jacuzzi tubs, and we’ve got plenty of room to store your bike and gear indoors. You can book your room online or call us at 717-733-6094. Whether you’re planning to ride or sit on the sidelines & cheer, we hope to see you at this year’s exciting Tour de Ephrata event!